What is a Knee Walker or Knee Wheelchair? And yes, you do need to know how to use a knee walker properly! While they give you great stability, they roll fast and have tight turning circles. These are 11 of our favorite 3 and 4 wheeler models which are well designed, tough and foldable! 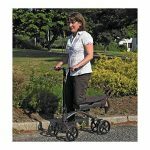 The design has changed over the years from small-wheeled machines for indoor use to larger, stronger orthopedic scooters with larger wheels for use outdoors. Modern rolling knee walkers are usually light and foldable by design such that they support the shin of the unusable limb when the knee is flexed. 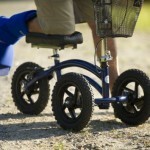 In this article, we’re going to look at how to use a knee walker properly in-depth. We’ll discuss how to get the right posture, balance, speed, and stability. We’ll also touch on what surfaces they work best on. There are several types of knee scooter for sale so try them in this position until you find the perfect fit. The handlebars of the knee wheelchair are supposed to be in a vertical position for them to work. The height of the handlebars are usually adjustable. All the best knee walkers offer you adjustability. They can be pulled up higher or pushed down lower to fit your height. You don’t want to be scrunched over your model- this will only lead to sore backs and shoulders. Most of them come with a knob which is on the handlebar’s tube. When you unscrew it, it loosens until you find the right height. You then screw it back into place and tighten it when you find your right fit. 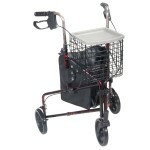 The seat of the rolling knee walker has a lever which helps adjust it. This lever can be found right below the seat. To lower the seat’s height or raise it, you have to hold on to the front firmly and pin it down. After that, you can flip the lever, or turn the screw, depending on the model, and loosen it. The lever comes with a safety pin to keep it in place so you’ll have to remove that to adjust the knee wheelchair’s seat. When you’re done, check to see if the lever is tight and secure. You can easily find any knee scooter for sale. What matters most is how you use it. Try using our guide on how to use a knee scooter and maintaining your knee wheelchair and you’ll be just fine. The first step before using your rolling knee walker is to ensure your good foot, the knee of your foot with the injury and your hips are level with your lower back. To move forwards, propel yourself only using your good foot to push yourself forwards. This is best to prevent further injury to the other already injured foot or knee. To balance properly on the knee scooter, lock in the brakes to hold yourself stable and prevent an accident. Then, place your knee on the seat cushion and level your body. Once you feel good, release the brakes and use your good leg to propel the knee scooter and yourself forward. 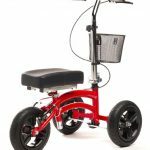 When you want to slow down, or you want to turn, push the handlebar and engage the brake so the knee walker slows down a little bit. You will be amazed at just how fast these scooters can travel. They are fast and so easy to get around corners, objects and doors with ease. The best knee walkers help you stay free from crutches. Crutches really are obsolete these days. They can cause further injury to your knee because you’ll keep using it. You can trip so easily when using crutches, they catch on raised protrusions, in doorways- anywhere! For people who have health issues such as arthritis, regular crutches are difficult to use on a daily basis. They can throw your whole body out of balance and strain it unnecessarily. While using a knee scooter in your home, you’ll notice that you’ll be able to reach for higher things in cupboards, shelves and on the wall using both hands. And still remain stable- no hopping on one leg. 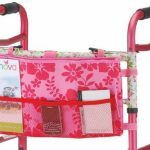 You can put personal items, shopping, the iPad and things in the basket attached to the scooter handlebars, leaving your hands free to steer the scooter. This makes for greater ease of use compared to crutches. 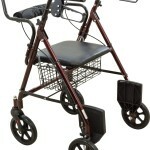 The best knee walker out of all the knee walkers on the market will work on all surfaces. You can tell by looking at how sturdy the wheels are. Also, read the descriptions in store or online to get more information about the benefits of the scooter model. 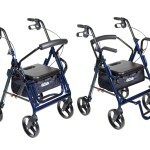 Some knee scooters can work in the house as well as on footpaths, roads, in a grassed park and will easily work on escalators.